Jakarta - The figure of Daniel Mananta or more often called VJDaniel is probably not a stranger to us. But I'm sure you all have not been familiar with the combat vehicle used by VJ Danieleveryday. Like most artists, Alphard chosen as the operationalvehicle lol man this hobby. The reason, "I like big cars, can keep all the items I need the time of shooting," said Daniel. 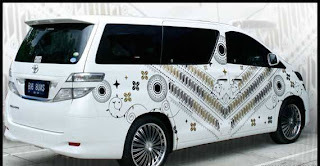 However, the Alphard is not allowed to white standards. "I need entertainment for ngilangin stress on the road," he said. HenceDaniel entrusting his car in the audio booth Somesound innumbers as a problem solver Pluit problem. Ahau-was offered bythe mobile lounge concept, and, "Adjusted to the taste of Daniel,"open Ahau. Two were installed head unit, Clarion VX400A to cabin the middle, and EVO E9C91 on the front. Speaker made ​​a separatepath, the goal that passengers and drivers can enjoy theirentertainment. Future use of coaxial speakers, in the middle ofthe cabin wearing split and coaxial speakers. For theater also serves as a car, then the settings should be able to create surround effects. That's why Venom VX402BII rear speakers at full range setting. While the speaker was using aHigh Pass Filter (HPF) is truncated at 100 Hz. "Subwooferfrequency was also cut at 100 Hz, so that Daniel can still enjoy alittle bass the beat," said Ahau again. As a supplier of power, two power amplifiers pinned. For a 'quota' speakers, supplied with 4 Venom PS80.4 canal. To lift the bass thump of a pair of size 12-inch subwoofer VX2002,entrusted to Venom PS1500.1. Not forgetting also presentedsize 26-inch Samsung LCD as the main entertainment. "I waswilling to plug the PS3 as well too, but baseball so deh, hahaha..." joked Daniel. There are unique from the installation of this LCD TV. In order tobring home theater-style mood, then the TV is mounted hangingAhau, not planted in a seat in general. How rigiditasnya? Ahau've been thinking about elements of mobility. That's why he made ​​from MDF wood mounting bolts are fastened directly to thebulkhead between the driver and passengers. Consisting of three sizes, namely 9 mm, 15 mm, and 18 mm. "18mm for the main construction of the bulkhead and the strongframe to withstand the LCD, while the 15mm and 9mm more toforming his bracket," explains Ahau. In this way, mounting the LCD to be strong and not easily moved.